While eager to demonstrate next year's Windows 8, Microsoft has been reticent to make any promises about a tablet friendly new version of Office sporting the new Metro look, a clear departure from Apple's strategy of presenting the original iPad with a suite of new iWork apps, but only after both were finished and ready to sell. Microsoft has outlined plans to bring the iPad's exclusive App Store software model to Windows 8, at least for the new Zune-inspired Metro apps that Windows 8 tablets will run. However, it hasn't announced parallel plans to bring its own Office apps. Instead, the company has said only that it is still only thinking about its Office options in the tablet arena, despite revealing plans to get Windows 8 itself to market within a year. Speaking with financial analysts, Microsoft's chief executive Steve Ballmer answered questions about a Metro Office release by saying, "you ought to expect that we are rethinking and working hard on what it would mean to do Office Metro style." The lack of an articulated direction for Office on tablets is notable because many Windows enthusiast observers are hoping Windows 8 will do to the iPad in tablets what Windows 95 did to the original Macintosh in graphical desktops. However, Office isn't just the icing on top of Microsoft's Windows cake. 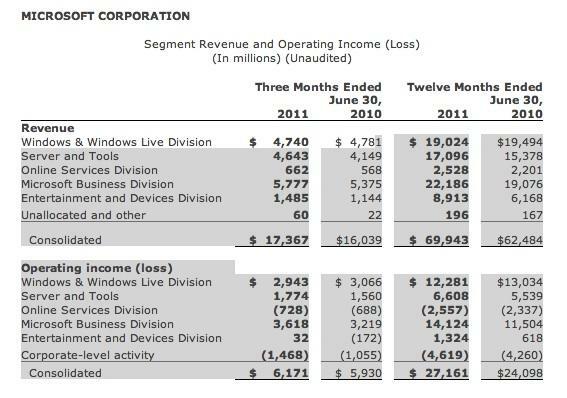 Microsoft's revenues from its Business Division (90 percent of which come from Office, according to the company) have now exceeded its Windows & Windows Live Division (representing desktop OS licensing). Office also earns Microsoft more profits than Windows. Windows is also experiencing stagnating growth, while the company's Office revenues and profits continue to grow at a healthy pace. And while Microsoft has emphasized its Xbox 360, Kinect, Zune and similar consumer devices, its Office group makes more than 100 times the profits of its entire Entertainment and Devices Division. Office is currently Microsoft's biggest cash cow, and it has long been near the top. Office has long been a key pillar of Microsoft's business. In fact, Office wasn't created for Windows; Windows was created as a way for Microsoft to sell its successful Macintosh Office apps on the DOS PC. The main attraction of the Windows PC was initially that it could run Excel, and later Word and PowerPoint, three apps Microsoft had created or acquired to build its Office suite on the Macintosh. Alternative PC operating systems, including IBM's OS/2, couldn't run the Mac's Office apps and Microsoft demonstrated no interest in porting Office to support alternative platforms it did not own. At the same time, Microsoft had encouraged the developers of popular or even critical apps for DOS users, including Word Perfect and Lotus 1-2-3, to port their software to OS/2. When Microsoft subsequently abandoned its OS/2 partnership with IBM and began selling Windows on its own, it was also left with the only productivity apps available for Windows. Microsoft subsequently co-marketed Windows 95 and its matching set of Office apps, almost instantly killing off rival desktop software and making Windows and Office paired standards for PC users. In the years since, Microsoft has deftly outpaced third party developers' attempts to bring Office competitors to Windows, even as it rolled new functionality into Office to take over new markets (such as messaging with Exchange Server and Outlook). On page 2 of 3: Apple and Office, Beating Microsoft in Software.